The recipe I posted for sticky toffee pudding back in 2008 resulted in a comments thread full of people reminiscing about A La Carte magazine. Back when I was a horrible precocious kid, my Mum used to get the magazine monthly. It was a beautiful thing, with gorgeous photography (unusual for food publications in the 80s), and some masterful typesetting, which I used to think back to fondly when I started working in magazines myself twenty years later. The recipes were heavily influenced by the extravagant, rich French style of dinner party cooking. Lots of butter and cream, everything spiked with as much booze as you could lay your hands on, and the sort of preparation that would have your mother sweating and swearing in the kitchen for entire afternoons as she stitched ducks and chickens together for hours at a stretch. My Mum used to lay on the most fabulous dinner parties, where she’d cook from A La Carte and from books by those 80s superstar chefs like John Tovey, Robert Carrier and Raymond Blanc. I didn’t get to come downstairs to try the food, but I could smell it wafting up through the bannisters that overlooked the dining room, and sometimes got to sample bits in the kitchen while she cooked. I also sneaked downstairs in the mornings while Mum and Dad slept the night’s partying off to work my merry way through the leftovers, including whatever wine was left at the bottom of glasses, thereby starting early on a life of dipsomania. She’s amazing, my Mum. She used to make petit fours from scratch. She made lucullan heaps of fruit glazed with lightly beaten eggwhites and dipped in caster sugar so they shimmered as if coated in powdered diamonds. The table would be laid with silverware polished until you could kill an ant with the reflections off a spoon. And we kids would be packed away to bed after handing out the chocolate-dipped physalis, devils on horseback, freshly roasted almonds or whatever other pre-dinner nibble she’d settled on, so as not to aggravate the guests. It was enough to raise an appetite that, in my case, has not yet subsided. 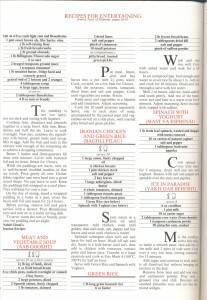 Although A La Carte, with its complicated and time-consuming recipes, hasn’t survived, it turns out that a lot of those who subscribed to the magazine kept their copies to cook from. Mike Ratcliffe, a reader of this blog, very kindly sent me scans of two pages from the December 1984 edition. They include a Christmas pudding recipe you’d be well-advised to make now ready for December, a boned and stuffed turkey recipe that other commenters here have been waxing lyrical over, and a yeasted sugar tart that sounds just the ticket. 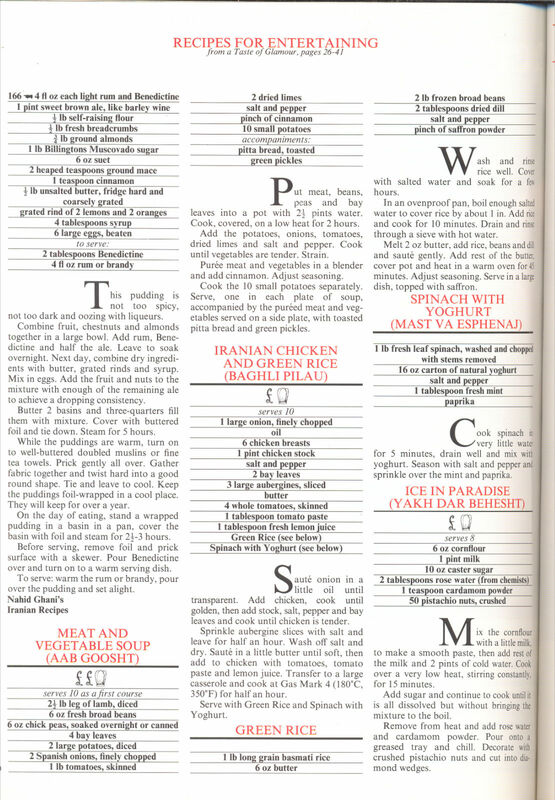 (I think you can probably leave the smoked salmon ice made wobblesome with gelatine safely in the 1980s, though; and the Persian recipes on the second page lack the sort of spicing we’d be used to nowadays.) Click on the images to enlarge them to a readable size. If any other readers out there have copies of the magazine with scans they’d like to share, please send them to liz@gastronomydomine.com – I’d love to hear from you, and I know there are lots of people out there who have similarly happy memories of 1980s bacchanalia they’re just as keen as I am to reproduce. 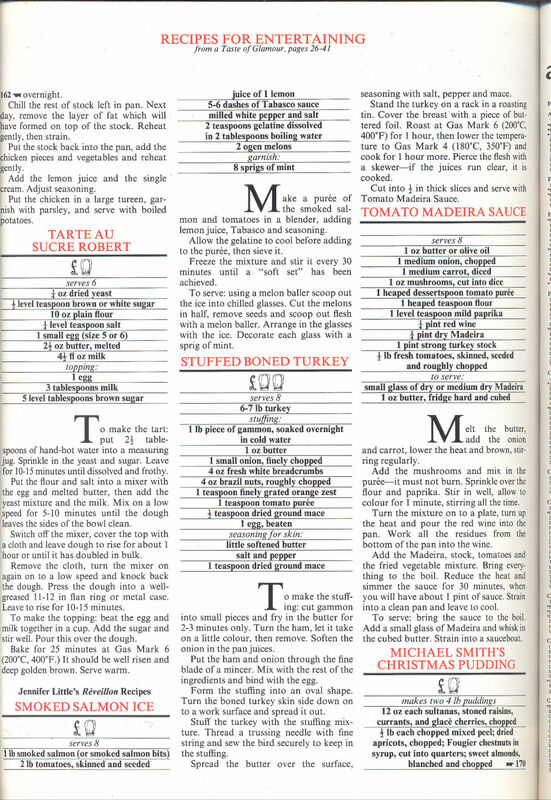 A la Carte Christmas recipes, Dec 1984. Click to embiggen. 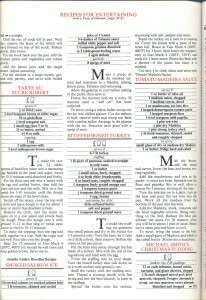 A la Carte Christmas recipes, Dec 1984, p2. Click to embiggen. I’ve been busy working on some new recipes while having a month off from blogging. 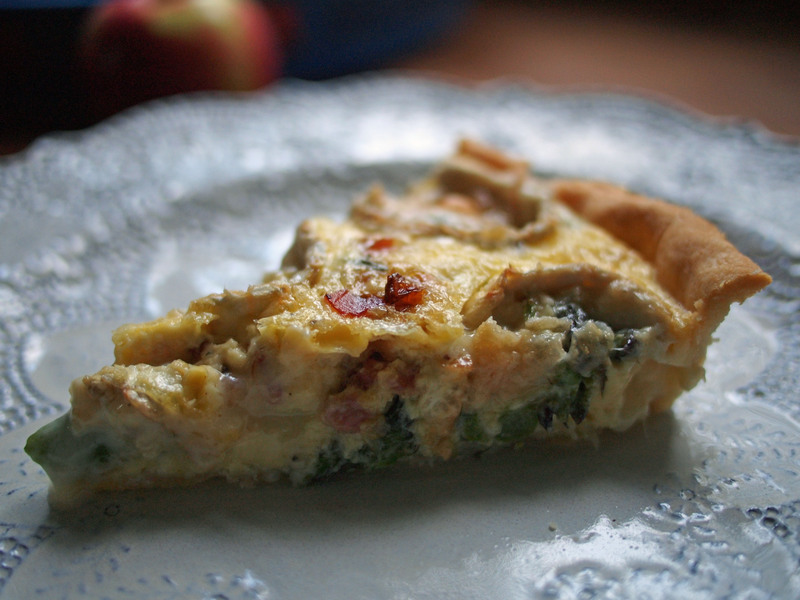 This is a really good-looking tart, great for parties. I love working with filo pastry; it’s very forgiving (any little tears can easily be ignored as you layer new sheets on), and the crisp finish is second to none, fantastic against the softened vegetables and the bite of the halloumi. Preheat the oven to 200ºC (390ºF). Toss the pancetta, the onion, diced finely, and the peeled, cubed potato in the olive oil with a large pinch of salt and some pepper. Roast for 45 minutes, stirring once halfway through the cooking time. The sweet potatoes should be turning golden-brown, and the onions should be sweet and golden. Turn the oven down to 190ºC (370ºF). While the sweet potato mixture is roasting, cut the peppers in half and grill them, skin side up, until the skins turn black and start to blister. Seal the hot, blistered peppers in a plastic freezer bag. The steam they release will help to loosen the skins and make them easy to slip off with your fingers. 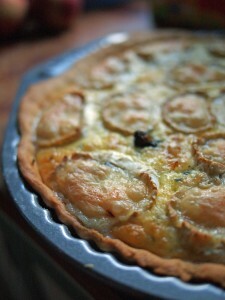 Line a loose-bottomed 20cm tart dish with filo pastry. Lay a sheet halfway across the dish and fold over any that dangles over the edge. Lay another sheet across the other half of the dish, brush them both with butter, and rotate the dish 45 degrees. Repeat the process until you have used up all ten sheets. Prick the base of the pastry a few times with a fork, and line with a circle of greaseproof paper. Fill the tart case with baking beans and bake blind for ten minutes. Remove the beans and paper. Chop the halloumi into pieces the same size as the chunks of sweet potato, and chop the skinned peppers. Toss the halloumi, peppers and thyme with the sweet potato mixture. Spoon the filling into the tart case. Bake for another 30-40 minutes until golden. Leave to rest for 10 minutes before popping the tart out of the case and serving. I kind of wish that supermarkets wouldn’t sell asparagus out of season – we’re all familiar with the tasteless, slightly limp kind whose sugars have long turned into starch, because the spears themselves have been bussed in from South America. Nothing’s going to taste good after that long in a cargo hold. 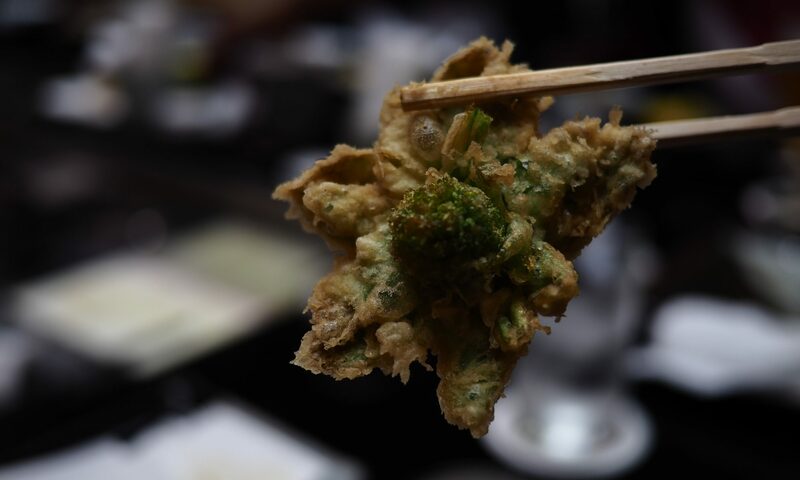 It’s enough to make you forget just how good a sweet, fresh English stem of the stuff can be. The English season is short, but it’s worth ignoring asparagus for the rest of the year and waiting for early May. From now on, we’ll have about eight weeks of tender local asparagus in the shops. If you are making your own pastry, rub the fats into the flour with your fingertips until the mixture resembles breadcrumbs, and add just enough water to make everything come together into a ball. Wrap in cling film and refrigerate for 30 minutes. Roll out on a floured surface. Use the pastry to line your 20cm tart dish, and pop the whole thing in the freezer to firm up for 30 minutes while the oven heats up to 200ºC (390ºF). While the pastry is chilling, fry the finely chopped shallots with the pancetta cubes in the butter, until the shallots are golden. When the pastry has had 30 minutes in the freezer, prick the bottom a few times with a fork, line the base with greaseproof paper, pour in some baking beans to hold everything down, and blind bake (this is just a way of saying part-bake; you’re doing this so that the crust is crisp and cooked) for 20 minutes. 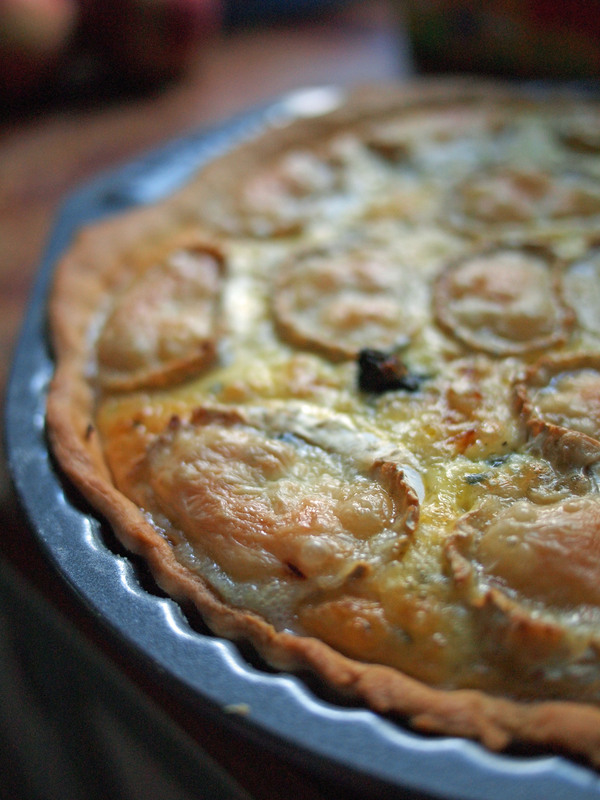 Remove the tart case from the oven and turn the temperature down to 180ºC (350ºF). Arrange the raw asparagus spears, chopped into pieces, to cover the bottom of the pastry case. Sprinkle over the pancetta and shallot mixture with the thyme. Use a fork to beat together the eggs and crème fraîche with half a teaspoon of salt and plenty of black pepper until smooth, and pour the egg mixture into the case. Finally, slice your cheese log into ½ cm pieces and lay them on the top of the tart. Bake in the cooler oven for 30-40 minutes, until the filling has set and the top is golden. Serve hot or cold. 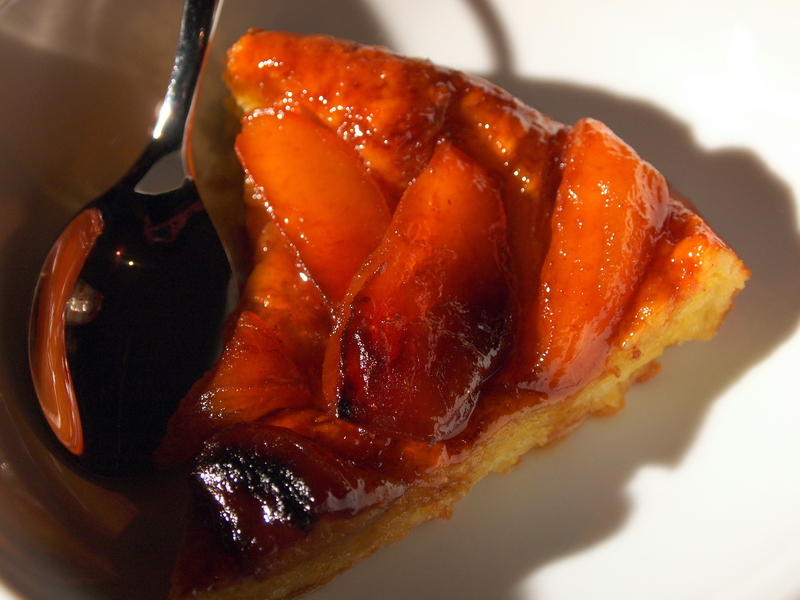 Tarte Tatin is one of those lovely recipes with an attached aetiological myth. Back in the 1890s, the Tatin sisters, who ran a hotel and restaurant in Loir-et-Cher (still open for business in 2010), had a kitchen accident when making an apple pie. Apples were left cooking an a mixture of sugar and butter for a little too long, and burned. Stéphanie Tatin, who was in charge of the kitchen, tried to save the dish by pressing a disc of pastry onto the ruined apples, and served the finished pie as a sort of upside-down tart. The hotel patrons raved about the resulting dish, a buttery, caramel apple classic was born, and the Tatin family ensured themselves fabulous advertising for their hotel forever. These days, you can actually buy specialised dishes to cook a Tatin in. I have a Le Creuset Tatin dish which gets used for a lot more than tarts – it’s very dense and distributes the heat gently and evenly, making it great for gratins, shallow pies and other baked dishes. If you don’t have one, a frying pan measuring about 25cm in diameter will do the same job, but it needs to have an ovenproof handle – check before you cook that the length of the handle will allow you to shut the oven door. 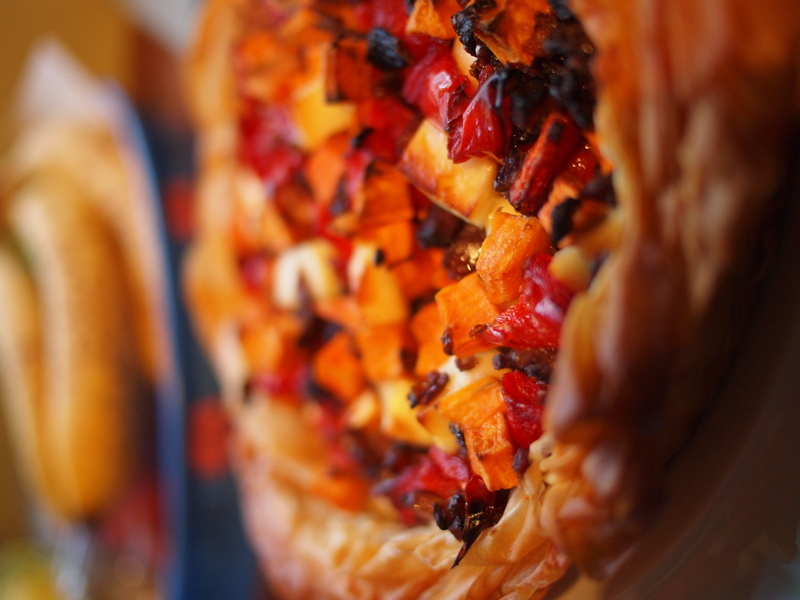 Prepare the pastry first, and let it rest in the fridge while you warm up the oven and prepare the apples. Sieve the flour into a bowl from a height, and rub the butter in until the mixture resembles breadcrumbs. Stir in the sugar, and bind with the egg. Depending on the weather, you may also need a little water to bind the pastry. Put the ball of pastry in a freezer bag and refrigerate. Core and peel the apples, and cut them into eighths. Melt the butter and sugar together in your Tatin dish or frying pan over a medium heat, and arrange the apple slices neatly over the butter and sugar mixture in the base of the pan. Back on the heat, keep cooking until the butter and sugar begin to caramelise. You’ll see the brown caramel bubbling up through the apple slices. The apple slices must catch and darken, so don’t be shy about taking the pan off the heat – the brown caramel should be visible across the whole dish, which should take 15-20 minutes. When the apples are ready, roll the pastry out into a disc the same size as your pan. 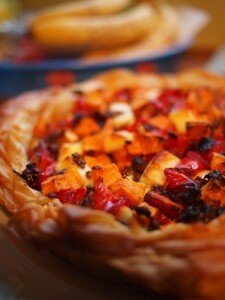 Set it on top of the apples and use your fingers to carefully press the pastry into the dish. Bake for 25-30 minutes until the pastry is golden. Remove from the oven and allow to cool for a few minutes, then put a plate over the top of the dish and flip it over, using oven gloves to protect your hands. The tart should drop neatly onto the plate. Serve warm, with lashings of cream.